Have you tried asking Yamaha? They will usually do you a deal where by you exchange the old roms plus cash for the new ones. Also I think this is why you might find it difficult to locate used roms as most will have been returned to Yamaha. Saul wrote: Have you tried asking Yamaha? They will usually do you a deal where by you exchange the old roms plus cash for the new ones. Also I think this is why you might find it difficult to locate used roms as most will have been returned to Yamaha. 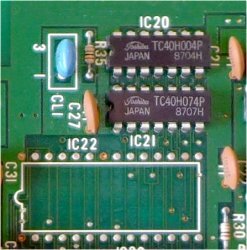 When I upgraded the ROM on my DX7IIFD years ago there was no trade in possible, so I still have the old one. Just a couple of years ago it was the same when I ordered SY77 upgrade ROMs (five of them were needed), no trade in, just a straight sale. Now of course that was with YamahaUS, Yamaha-Kemble or other Yamaha regions may do it differently. DX7IIFD, SY77, SY99, Hammond C3, Steinway L, CP300, AW1600, etc. I asked Yamaha technical help and they told me they could only supply the latest Roms and that was if they had any left and i think it was a big if.......just thought i'd ask though. Thanks guys. There is a set of ROMs for the '99 on eBay at the moment.. you may want to sit down before looking at the price..
Looks like 8 ROMs in that upgrade, when I ordered the SY77 upgrades ROMs four or five years ago there were 5 ROMs in that upgrade and it was around $450.00 US from YamahaUS (averaged $85 per ROM). So the SY99 ROM upgrade shown should be in the vicinity of $650.00 US or more plus shipping if ordered from Yamaha. The listing is now gone so I can't go over it again. When I ordered the SY77 upgrade, there were no wave ROMS that I can remember and it was still five ROMs to do the upgrade, OS ROM, sequencer ROM, etc. Anyway, upgrade sets do seem to be somewhat expensive and there certainly don't seem to be many floating around on EPROMs that have been burned. This is what Yamaha USA in California sent me over 5 years ago when I requested the latest upgrade. At the time it was version 1.5 and consisted of one CPU and one ROM only. But there was a problem that neither their customer service nor myself knew at the time. Apparently there are two versions of the SY99 synthesizer out there: one with a CPU that can be removed easily with the proper $2 tool that the user supplies, and one with a CPU that is an SMD chip soldered on the main board. Initially Yamaha sent me the two items shown in the middle of the picture. They charged the same price for the CPU and the ROM. The CPU that sold for $79.48 was the SMD type. I needed the one that I could remove easily from its square socket, not the one that required de-soldering and soldering with a very expensive SMD re-work station. Hence I sent it back and they sent me the part shown on the bottom of the picture. It is more expensive than the SMD type CPU. The actual box is shown on top. That CPU can be replaced easily but if you do not have the proper $2 tool to remove the chip you will break the square socket and it's over; bye-bye SY99. The ROM contains the improved software but Yamaha also claimed (as the Musitronics extension description did too) that part of the new improved software was stored in the CPU and this is why you need to replace both chips. The final cost to me with shipping charges was $230 over 5 years ago. I do not know why that seller in UK advertises so many chips. Yamaha needed to replace the SY99 software only, not the waveforms. I have never heard of any problems with the waveforms and hence I see no reason for them to be replaced. EX5_etc wrote: The ROM contains the improved software but Yamaha also claimed (as the Musitronics extension description did too) that part of the new improved software was stored in the CPU and this is why you need to replace both chips. The CPU (http://www.datasheetcatalog.org/datashe ... 7422_1.pdf) contains both a 1 KB RAM and a 32 KB ROM memory, so I'm pretty confident that the ROM part contains some relevant program code - especially as far as wave memory addressing is concerned. However, both the ROM chip and the CPU ROM part can be read out and even the CPU has a programmable version on the market (even though I have not checked price and availability, but there seems to exist a FLASH version, too), so if someone could download the code from both the CPU and the system ROM it would be quite possible to create 'aftermarket' components. If someone has the code or components to download the data from, just let me know! by reading this forum I came across the sector101 website and ordered 5 memory expansion boards for my SY. All I can say is that they're awesome!! I might say to me they are THE BEST EXISTING CLONES of the SY 99 SYEMB-05 Memory Expansion Board! And I have to say that I'm deeply satisfied with Brians support, it's excellent! Last edited by Miks on Mon Jun 06, 2011 10:42 am, edited 1 time in total. I certainly don't have any problems with your sharing the contents of those rom chips. Of course Yamaha probably wont like it as it's their copyright etc but since the SY99 isn't exactly a current product and it often comes down to users to support these discontinued lines I really can't see what their argument against it would be. Apart from the usual legal nonsense of course. Anyone else want to share their 2 cents on that ? thank you for your welcome. I fully agree with your statement. Perhaps they should be glad that there are people who want to keep their Yamaha equipment 'up to date' even if it's obsolete since many years. To me that shows the quality of these gear still after all those years. If I were a manufacturer I'll be happy to see that my products are still in use long after they are outdated... and I think Yamaha's not making lots of money by selling those upgrade kits today... if still available. Away from that there is one last hurdle to take: the H8/532 CPU !! I believe it is hard to find nowadays, and if, the price will be shocking. But if someone can manage to get one (or more) and program it with the required data and upgrade his nugget... WHY NOT!?! I agree, I bought and paid for all of my old Yamaha gear (and I'm the original owner of record with Yamaha for all of it except my SY99), so if I want to maintain that gear in optimal operating condition and Yamaha can't or won't support it any longer, then I'll use whatever means necessary to keep it working. Welcome to the Forums! Thank you for posting that info and I look forward to your participation on the forums.